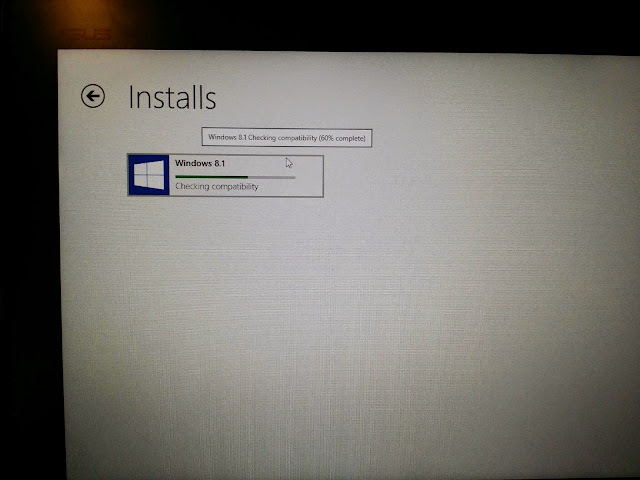 I've attached a photo of Windows 8 updating to 8.1. I'd assumed my convertble tablet already had 8.1 because I'd checked for updates a few different ways and the 8.1 update was never offered (until recently). I bought this device after 8.1 was released, so it was reasonable to assume it was pre-loaded. Before today I didn't need 8.1, I tend to stay on the desktop side of things. Now I need it to try out a new app that requires it. Anyway, if you can see the photo, Windows 8 has the least verbose install screen I've ever seen. You can hold a mouse cursor over the progress bar to see a percentage, otherwise all you see is the name of what's being installed, progress bar and a brief description of what it's currently doing. It's design decisions like this that make me feel like I could not be more differently minded than whoever designed and approved this. Why obscure any useful information? Why no download bitrate (when it was downloading)? Is it clean? Yes. Would a percentage indicator clutter it up too much, or a bitrate counter? I really don't think so. I have to say I'm indifferent to Google's new Material design rules as well. They seem to be raising contrast in their interfaces, which I think is good. Every update to the web Gmail dashboard seemed to be an attempt to remove contrast, to make it harder to pick options and features out at a glance. Though now that I think about it that could have been because of their advanced email tagging system, which raises contrast between the messages themselves. One thing I absolutely dislike about the Material design in Android 5.0 is the recent app screen. On previous versions they're neatly spaced in a vertical or horizontal column, the most recent few are on screen but you can scroll over to other ones. In 5.0, at least in a preview I saw, you could only see the most recent app, and you had to slide the top one away to see the next one under it "like pieces of paper on top of each other". So instead of opening recent apps and clicking on the one I want, I have to wade through them to find the right one. It's a small thing, but it doesn't seem more convenient to me. By the way, Chrome for Android has had similar functionality for a while, where the tabs aren't evenly spaced out, they're usually clustered to one side you have to dig through them to find the one you want. That and it's inability to disable the address-bar-hiding full screen mode are why I don't use Chrome for Android much anymore.